Posted on 2015-12-12 at 02:03 in Images by Robbi-985. 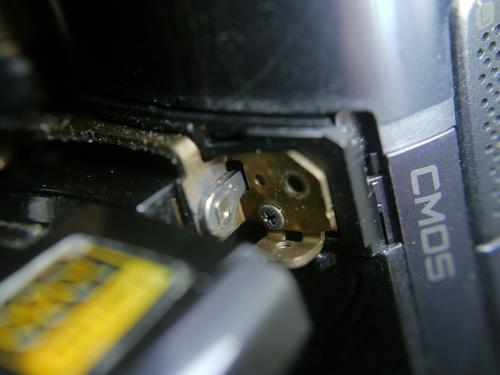 HDD with rubber padding removed. Inner face of control panel (hinged LCD is still attached on the outer side). The speaker is at the bottom, with the memory stick slot above and to the right of it. 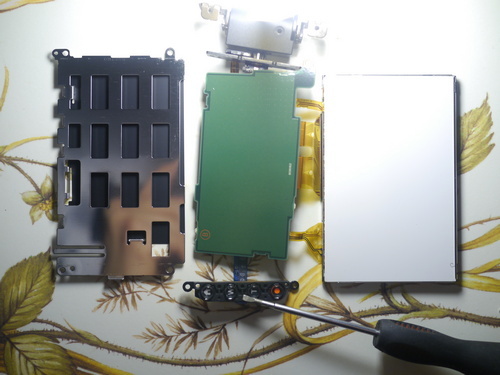 Inside of main body with control panel side removed. 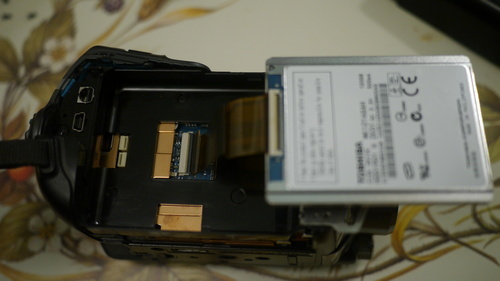 Inside main body. 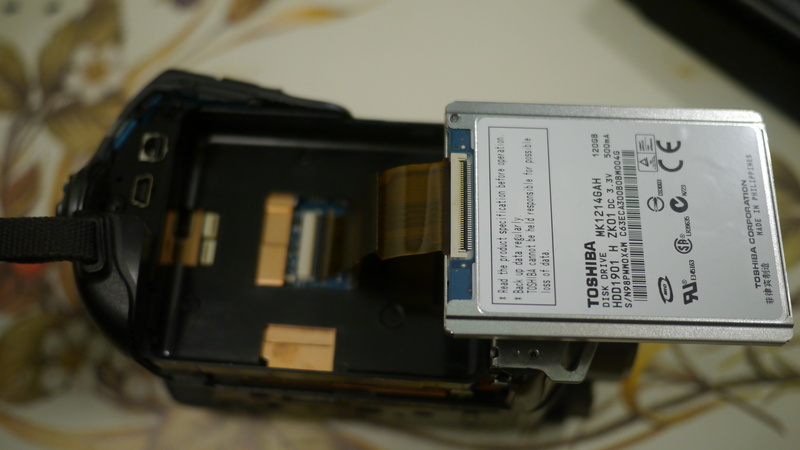 There’s what appears to be a backup battery cell directly behind the memory stick slot (although if that’s what it really is, mine is dead). 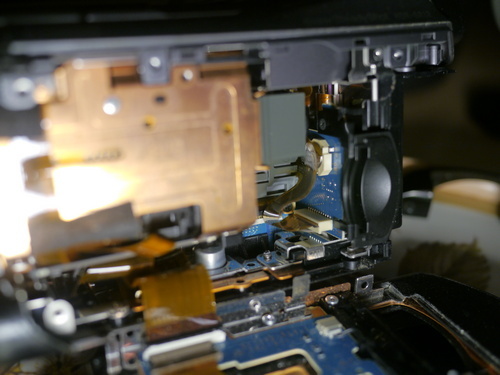 Inside main body. 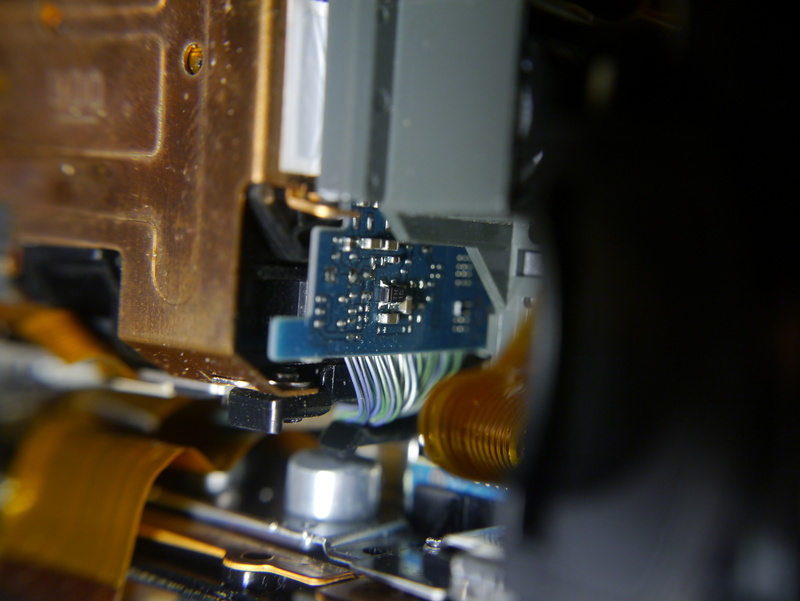 The large flash capacitor can be seen hiding behind a silver-coloured metal shield. 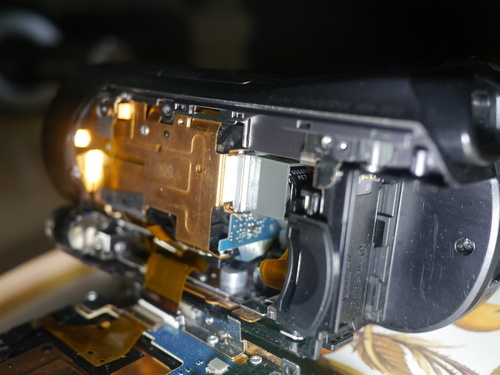 Inside main body. 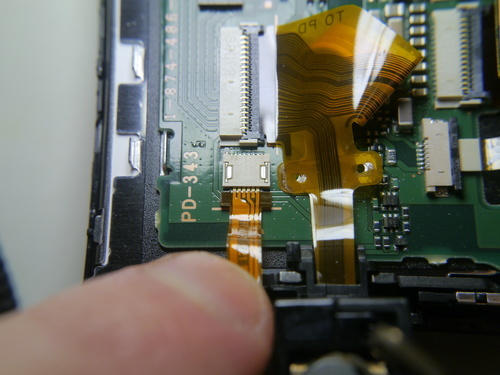 Circuit board at the back of the imaging area. but I didn’t feel like messing with this area to find out. Upper cable: Connection between main board and the control panel side (including LCD). 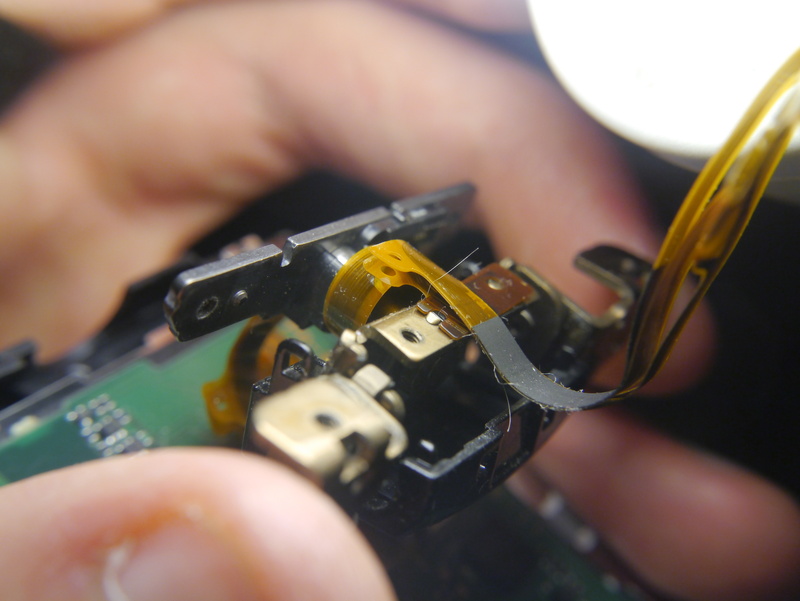 Lower cable: Goes from back of control panel (board) around to the LCD (via flip-hinge), not pictured. Open/close hinge for the LCD (side view). 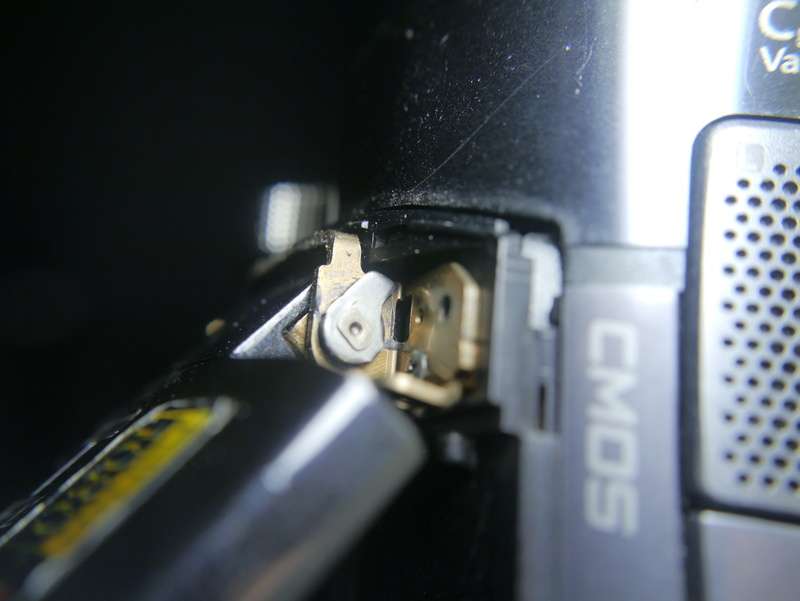 Open/close hinge for the LCD (top view), fully-closed. The “b”-shaped part rotates into a slot to restrain it to a 90-degree range. 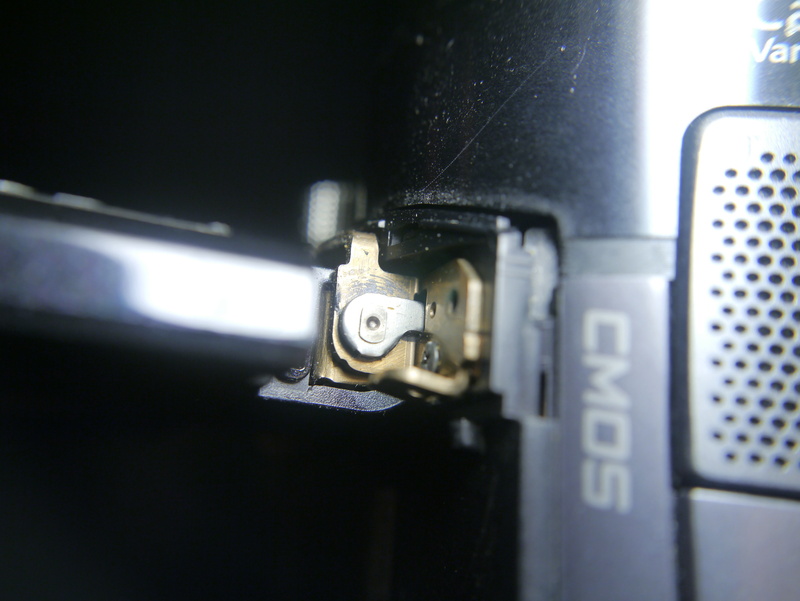 Open/close hinge for the LCD, half-open. 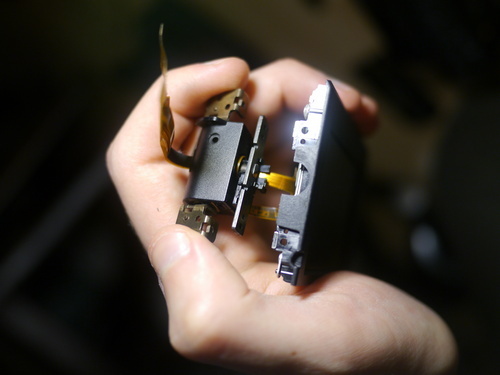 Open/close hinge for the LCD, fully-open. 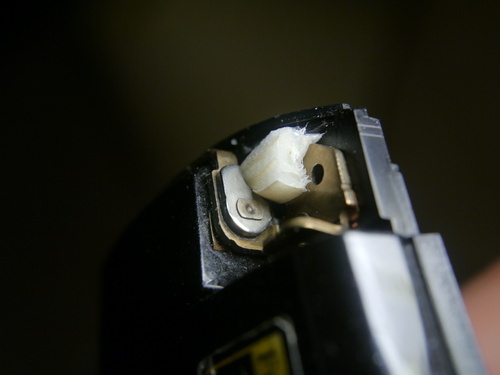 View of the “b”-shaped part slotted into the hole on the open/close hinge for the LCD. 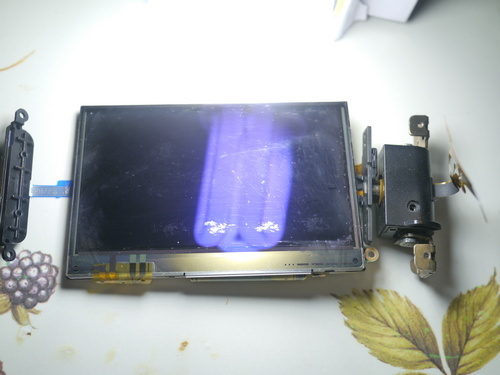 LCD part, detatched from the control panel and with its back cover removed. The flip-hinge is on the left (rotated 90 degrees). 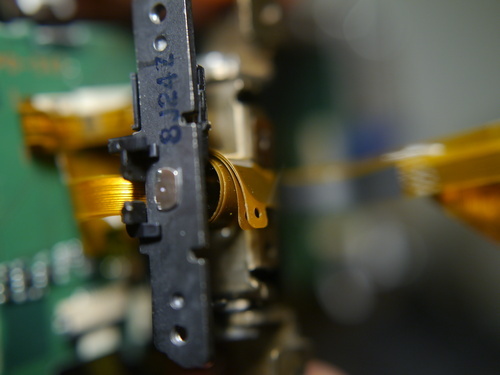 Cables from the LCD’s circuit board going out to the flip-hinge (bottom of photo), which ultimately connect to the control panel board. Cables from the LCD’s circuit board going around the bottom of the board to the LCD and touchscreen. 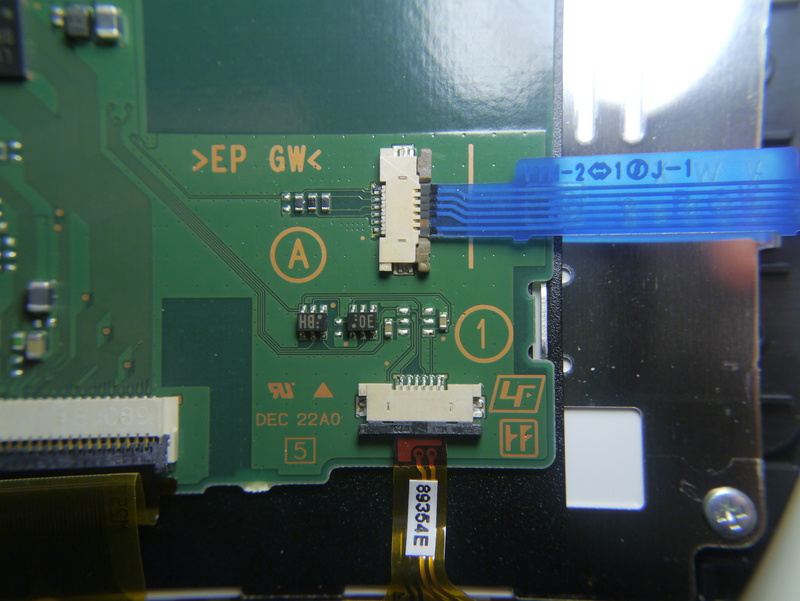 The blue cable goes around the side of the board to 4 buttons on the side of the LCD frame. The edge of the LCD part (right of the photo), connected via cables to the flip-hinge (not rotated here). 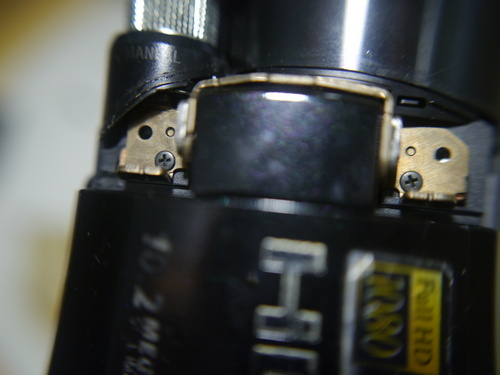 The metal open/close hinges are attached to the top/bottom of the flip-hinge. The cable coming out of the left of the flip-hinge normally connects to the control panel board. 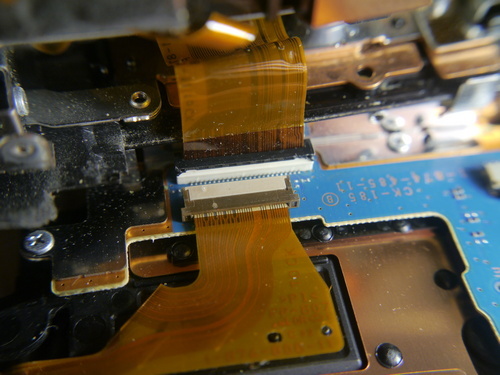 Inside the flip-hinge (with the plastic cover removed). The ribbon cable coils around an axle. To the left is the LCD circuit board, and the cables on the right go to the control panel board. 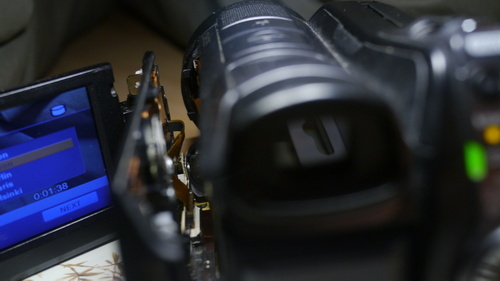 At the bottom of the photo is the LCD board, and the cables near the top go to the control panel board. 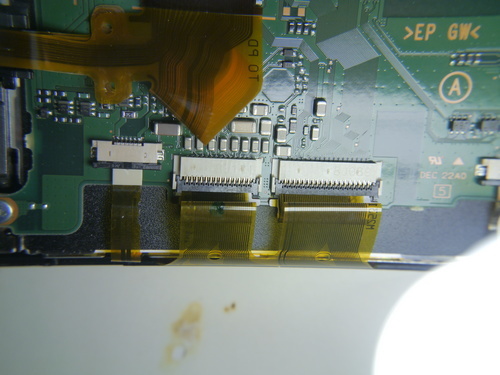 Left: Metal plate with sheet of plastic, originally between the LCD and its board. 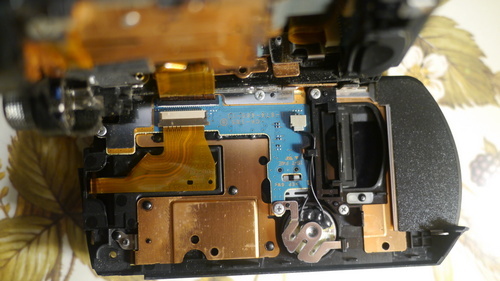 Middle: Rear of LCD circuit board. Right: Rear of LCD. Bottom: 4 buttons which mount to the side of the LCD frame. 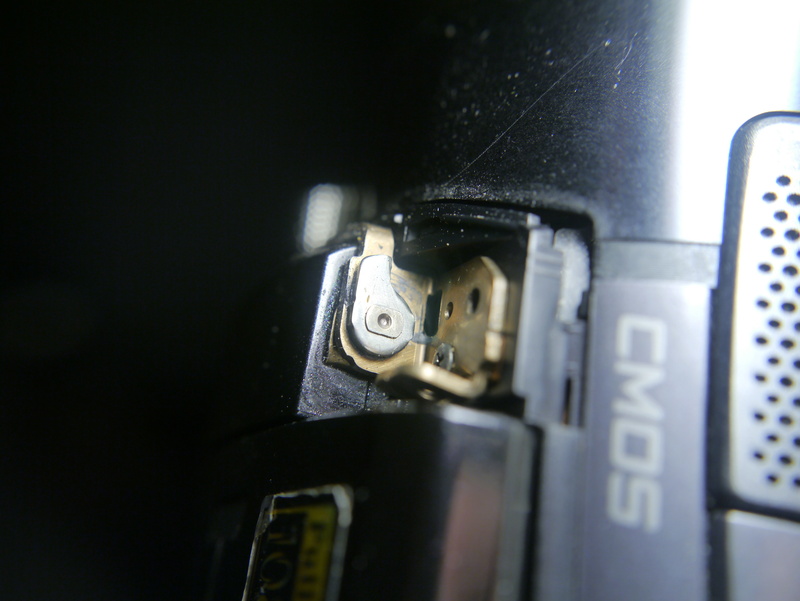 Top: Flip-hinge. 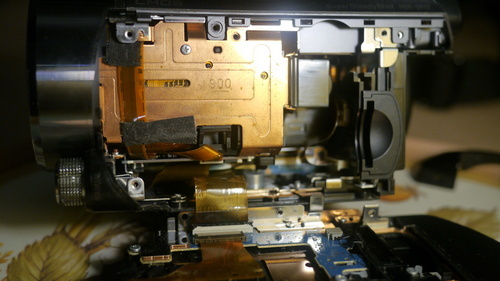 Front (usually-visible) side of LCD. I had actually tried to clean it. The rear of the 4 buttons is on the left, and the flip-hinge is on the right. 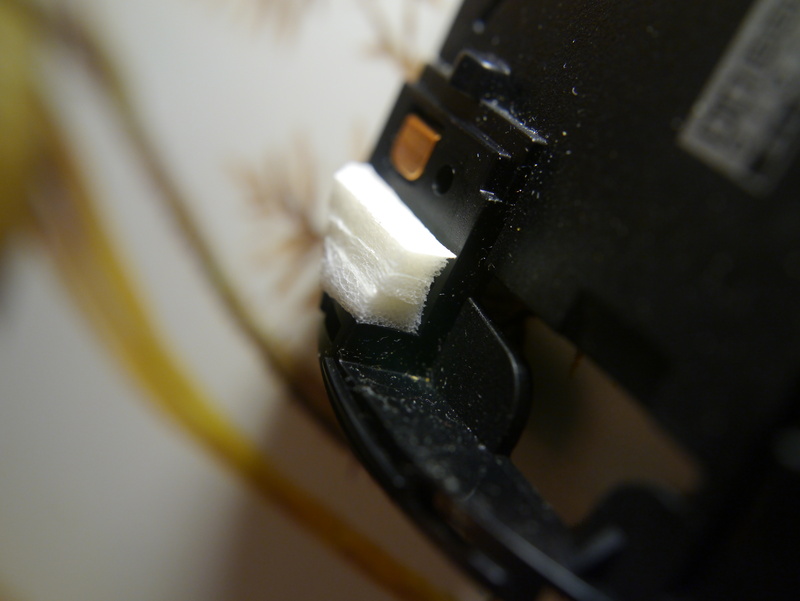 Some padding (white block) that I stuck in the hinge area to attempt to fix the loose, flappy open/close hinge, and make it hold its position as it should when the LCD is open. with my block of padding stuck in place. Spoiler: It didn’t help at all. while the control panel side was not yet mounted back to the main body.